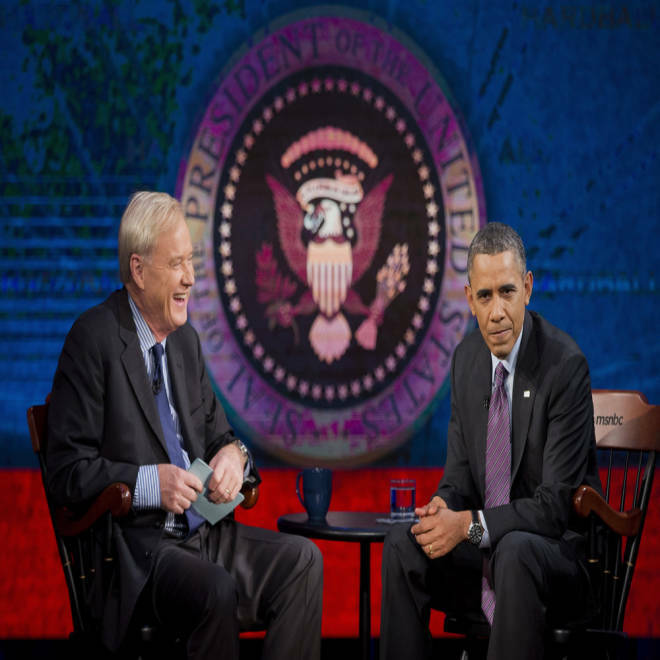 President Barack Obama talks with MSNBC's Chris Matthews on Thursday, Dec. 5, 2013. Republicans ought to be “embarrassed” of their record low productivity during their time in charge of the House of Representatives, President Barack Obama said Thursday. In an interview with MSNBC’s Chris Matthews, the president said Republicans shouldered most of the blame for gridlock in Washington, especially as GOP lawmakers tend to the ideological concerns of their party’s conservative flank. As the White House works to move past a rocky few weeks in which Republicans seized upon the troubled launch of key portions of Obama’s signature health reform law, the president has pivoted to highlight inaction on Capitol Hill. Obama has spent much of this week hammering Republicans in Congress for failing to take action on his agenda – or worse, even proposing a viable alternative. Republicans have sought to respond this week by highlighting the 150-some bills they have passed (ranging from repealing health care reform to tax cuts to other GOP priorities) which have languished in the Democratic-held Senate. The question of gridlock and the specter of a “do-nothing Congress” label is already emerging as a potential story line in next November’s congressional elections. Republicans are looking to defend their slight majority in the House and pick up a net of six seats in the Senate to retake control of the upper chamber from Democrats. Republicans have held control of the House since the 2010 elections, while Democrats won control of the Senate in the 2006 elections and have maintained their majority since then. Polls testing the so-called “generic ballot” – voters’ preference of a generic Republican candidate versus a generic Democratic candidate – have fluctuated throughout the fall. Democrats took an advantage amid the government shutdown in October, though Republicans have been resurgent in most polls due to the troubled launch of HealthCare.gov and other controversies surrounding Obamacare. The most recent NBC News/Wall Street Journal poll, conducted at the end of October, found that 45 percent of Americans would prefer a Democratic-controlled Congress as a result of the 2014 elections, while 41 percent want Republicans in charge of Congress. Frustration with Congress is also broadly reflected in most recent polls, too. And Obama hinted that voters next fall who are frustrated with the state of business in Washington should make the most of the opportunity to shuffle the makeup in Congress. Obama also hinted at his preference for Democratic control of Congress, which he enjoyed during the first two years of his first term. The president said it’s been when one party controls Congress, throughout history, that the most progress is made in Washington.